I read an interesting article this week from the Chicago Tribune discussing the top 5 items Americans assess on nutrition labels. To my surprise, the top 5 included: whole grains, dietary fiber, calcium, Vitamin C, and protein. If I had to take a guess at what would’ve the top 5 items, I would have said high-fructose corn syrup, sodium, saturated fat, calories, and hydrogenated or partially hydrogenated oil. I think it’s great that people focus on whole grains and dietary fiber in the diet, but the other ones are surprising to me. Most people know what foods are high in calcium, Vitamin C, and protein…and for me, they’re not commonly questioned items when providing nutrition consult to individuals. Granted, that is based on my experience among the obese, diabetic, and renal populations. Nonetheless, a very interesting report on consumers and label reading. This weekend my in-laws visited and I made Biz’s delicious Baja Fresh Grilled Salsa…again! I love the stuff! And apparently I enjoy making it for family because the last time I made it, my parents were visiting. 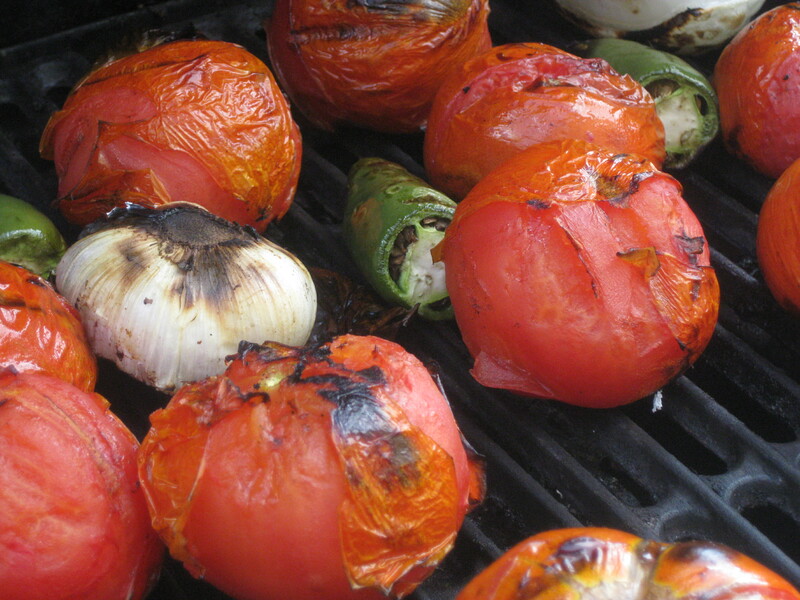 Grill vegetables until they are charred, but not falling apart. Place all ingredients in a food processor or blender and blend until smooth-ish. Serve with your favorite tortilla chip. Question: If you’re a label reader, what’s the #1 items (ingredient, nutrient, etc.) you look for and why? On grains I definitely search for “whole” as the first word on the ingredient label. I also look at saturated fat, sodium, fiber, and carbohydrates (simply because I control the number of carbohydrates in each meal because of PCOS and insulin resistance). That salsa sounds awesome – I absolutely LOVE making my own! And I always ended up rubbing my nose or eyes after slicing jalapenos… bad news! I’ve been thinking about making some salsa…I think this makes up my mind for me! And I ALWAYS read nutrition labels…it takes me forever in the grocery store! I usually look for whole wheat, check out how much sugar and what kinds, fat content and what kinds, and I have a child with a nut and egg allergy – so I have to check that out as well! Sounds like a delicious salsa, and good tip about wearing gloves when dealing with hot peppers… I have definitely made the mistake of rubbing my eyes or nose even after washing most of the pepper juice off of my hands – ouch! Great post Nicole. I saw that article too, and I was shocked myself! I would totally agree that HFCS and hydrogenated veg. oil would be what I would have guessed (although I for sure what have guessed protein too, so I got one right!). I am glad Americans are looking for whole grains. That makes me smile. Fiber too! The vitamin C, however, is so random. No wonder vitamin water sells so well! 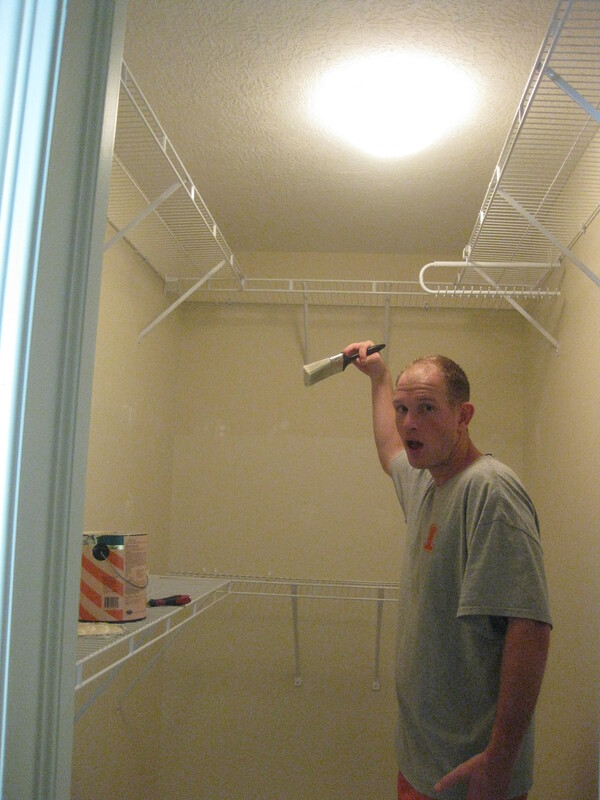 Your closet is bigger than our bedroom. Damn you. 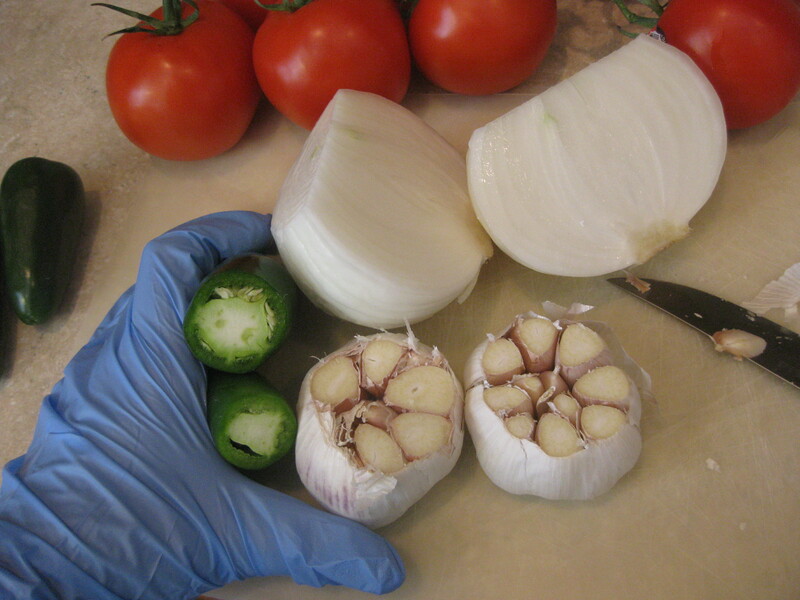 Great looking salsa, AND I love that you are wearing gloves to cut the onion! Such a great idea. I also wear goggles. Those still don’t help. I always look for calories and grams of fat on labels. I rarely look at the vitamins on labels, unless the front label is bragging about being really high in it, then I have to see just how high it is. 😉 Plus, like you said, it’s really easy to get in vitamins if you eat a lot of fresh produce, so it’s silly to be looking for that stuff on labels. I think the top things I look for are the words/terms hydrogenated, corn syrup, and artificial. I also check the label for calories (I don’t count, but I like to conscious of how much I’m consuming! ), sugar content and fiber content. I don’t care too much about sodium because I don’t add a lot when I’m cooking, the only thing I EVER use my shaker for is homemade EVOO popcorn, I don’t eat that much processed food and I sweat more than I’d care to share when I’m exercising, so if something’s a little higher in sodium than most people would like I don’t worry too much about it. 😉 Oh yeah and I don’t have high blood pressure, clearly. I looove salsa, so I just might have to try Biz’s! 🙂 I’m jealous of your protective gloves, by the way. 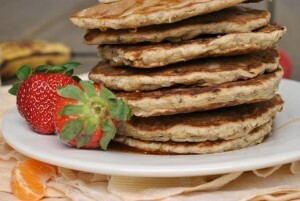 I look for the ingredients particularly keywords such as sugar and HCFS . I too prefer food with few ingredients that I can pronounce. I also look at calories, fat and sodium but find that pass over a fair amount of items based on the ingredients and never get to the other facts. 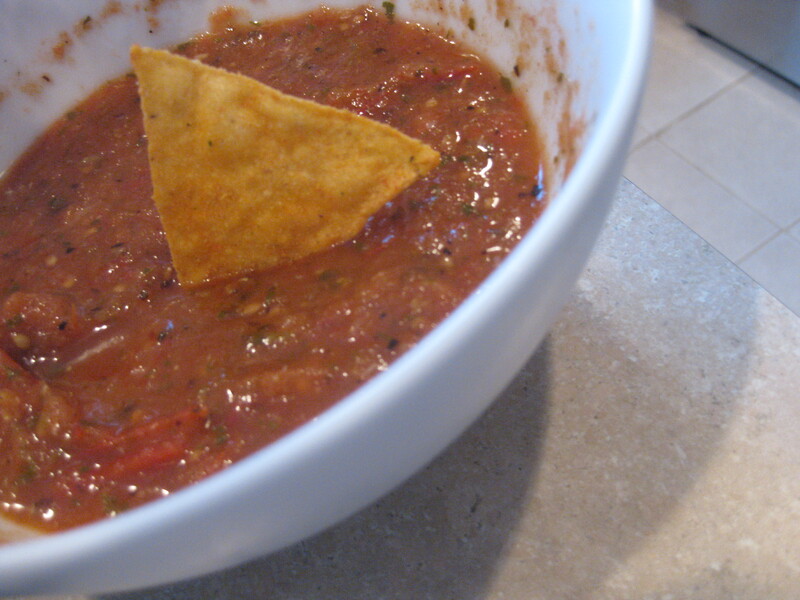 Salsa looks really good,love the colour and home made ones are the best anyday…. I’d have guessed fat and hydrogenated oils too! I typically look at fiber, calories, protein, hydrogenated oil, and sometimes calcium. That salsa looks soo good. I love grilled veggies! They’re a summer favorite! A lot of items that are high in Vitamin C, calcium, and fibre don’t come with labels (ie. fresh produce). I mostly look at the ingredient list when I read labels looking for the number of ingredients and the number of additives and types of sugars. 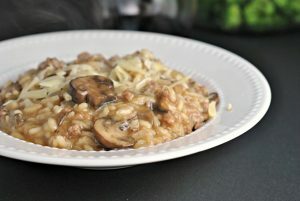 On labels I look at Carbs, Fiber and Protein. I love Biz’s recipe, but I haven’t made it with onion. Like you, I love onion. I’ll have to try this soon! I for sure look at calories first, then fat, carbs, and sugar. Grilled salsa sounds SO amazing..it’d be like salsa 2.0!! 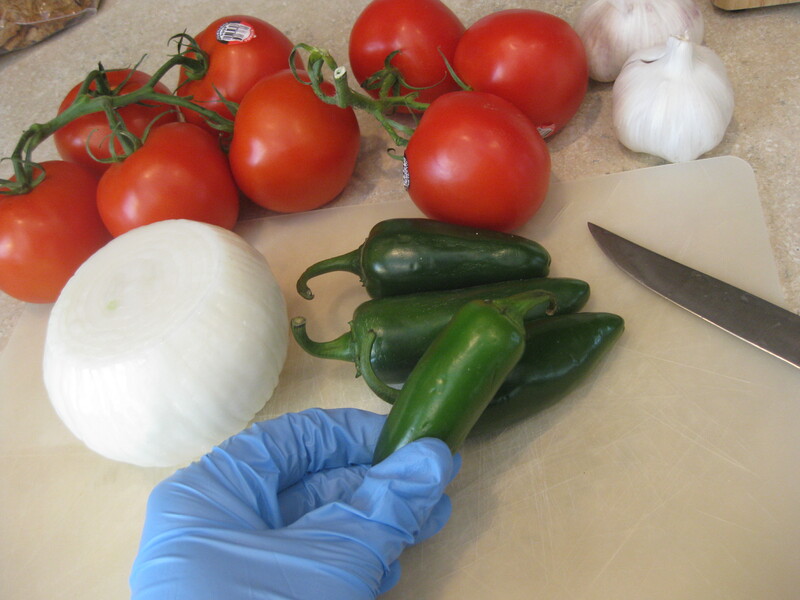 Hey Nicole, you should add this to our appetizer recipe link up for Get Grillin’…..lovely salsa!